I’ve seen many bloggers say that what draws them to certain books or authors is good writing, and what causes them to stop reading a certain book or author is bad writing. What constitutes good writing and bad writing to you? My idea of “good” writing is writing that makes me stop and re-read a sentence because of how beautifully or powerfully it conveys its meaning. Additionally, writing that breaks the conventions of “traditional” language structure as a part of the overall experience typically strikes me as exceptional, though it has to be well-crafted and consistent (Zuzak’s The Book Thief comes to mind). “Bad” writing is tough to nail down, because while I don’t always think writing I don’t enjoy is “bad,” I wouldn’t call it “good,” either. I suppose standard, “He said this. Then they did this. The next day, this happened,” would technically be considered mediocre. For truly “bad” writing, I’d say poor syntax, redundancy, inconsistencies throughout the text, and underdeveloped characters or plot lines are all super pet peeves of mine. While a mediocre book’s author may get a second go-round if I liked the story, a bad book’s writer doesn’t get another shot. Life is too short to read bad books! What are your thoughts? Share them here, or post on your own blog and drop me a link! Today’s question is suggested by Mae. “I couldn’t sleep a wink, so I just read and read, day and night … it was there I began to divide books into day books and night books,” she went on. “Really, there are books meant for daytime reading and books that can be read only at night.” – The Unbearable Lightness of Being, Milan Kundera, p. 103. Do you divide your books into day and night reads? How do you decide? In the past, I’ve had at least one new book that I read during most of the day and a re-read for before bed, so if I get sleepy and forgetful I’m not really “missing” anything :) Lately though, I’ve only had one physical book going at a time – very rare for me – and whatever book I’m working on goes with me into whichever room I’m in throughout the apartment. My audiobook is for the walk to and from work, as well as for when I’m performing tasks like dishes, cooking, etc., and my hands aren’t free. So I suppose I determine what to read based more on convenience than the mood a book evokes. How about you? Do you designate certain books for certain times? Do you feel certain books lend themselves to a time of day? You’ve just dropped your favorite, out-of-print book into a bathtub, ruining it completely … What do you do now? Ack, terrifying question!!! First, I probably wouldn’t put a book like that in danger – I’ve worked very hard to obtain some of my books, particularly butch-femme and other queer works, and I know just how difficult they can be to find. My wish list includes many such titles, and I can’t even explain the excitement it creates when one turns up somewhere! This has actually prompted me to pipe dream of owning a small press that specializes in obtaining the rights to such books and running small batches every decade or so, to increase their circulation and accessibility. Now, pretending that I actually would have done such a horrific thing, I’d likely first run to the computer and search for repair/preservation options and try everything I could find. Should the book truly end up an unreadable pulp (I’m crying a little bit, here), I would begin the hunt for a replacement on every site I know – swap sites like BookMooch, used/rare sites like Alibris, and monster aggregate sites like Amazon – and put in a word with all of my local independents that buy used books. How about you; what’s your go-to for finding or replacing a rare title? Are your book choices influenced by friends and family? Do their recommendations carry weight for you? Or do you choose your books solely by what you want to read? The books I buy are almost exclusively based on recommendations from family, friends, and book bloggers whose opinions I value. Rarely do I pick up a book without having heard anything about it previously, though I’ve been broadening my horizons that way with audiobooks recently. Now it’s all you – what turns you onto the books you read? I used to have such a hard time leaving a book unfinished, but in recent years, I have forced myself to abandon a book if I’m just not feeling it. There are far too many books I know I will actively enjoy, even love, and my reading time is precious. Why spend it trudging through something I’m not getting any pleasure out of reading? This comes at an apropos time, as I’ve been struggling with my guilt around having only read part of The Mayor of Castro Street. It’s not Harvey, it’s the author. I’m just not into his journalistic style, and the attempts at making it sound more like a biography than a news article fall short of the mark; they’re clearly not his natural voice, and thus they stick out like sore thumbs. I needed a reminder that it’s okay to leave the book unfinished, and this served the purpose. Thanks, Deb! What are you currently reading? I’m currently reading Harry Potter and the Half-Blood Prince, A Million Little Pieces, The Mayor of Castro Street, and The Adventures of Tom Sawyer, and listening to Aesop’s Fables. What did you recently finish reading? I most recently finished Harry Potter and the Order of the Phoenix. What do you think you’ll read next? Because five books in the works doesn’t keep me busy enough until next Wednesday??? :) I’ll probably finish HP6 this week and move on to book 7, and hopefully get through the Twain as well, which I’m reading on Stanza on my iPod. I feel bad for abandoning Harvey, but I’m just not great at soldiering on through non-fiction; I really ought to keep that one in my bag so I’m forced to read it on the bus, and have to be home to read the “fun” stuff. 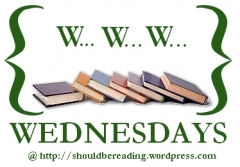 What’s your WWW this week?